British photographer Richard Davies inspired with the postcards describing the Russian wooden churches decided to travel to the Russian North. His recently published book of photographs “Wooden Churches – travelling in the Russian North” raises public awareness of the plight of Russis’s wooden churches. In the summer of 1902, Ivan Yakovlevich Bilibin (1876 - 1942), a well-known artist, stage designer and illustrator of Russian Folk Tales travelled to the Vologda Province in the North of Russia. As well as collecting and studying the local folk art, he drew and photographed the wooden architecture. During the summers of 1903 and 1904, he was sent by the Russian Museum in St Petersburg to the Vologda, Archangel and Olonets Provinces to collect works of folk art, which subsequently formed the basis of the museum's Ethnographic Department. Many of the photographs taken on these trips were used as illustrations in Bilibin's 1904 article in the World of Art Magazine entitled Folk Art of the Russian North. The article drew attention to the condition of the wooden churches: "the state of the churches is most lamentable. In the hands of uncivilized people, they are being vandalized to the point of destruction or are ruined with 'restoration' to the point of being unrecognizable," Bilibin wrote. His photographs were also used in the section “Wooden Architecture of the Russian North” in Igor Grabar's monumental History of Russian Architecture published in 1909. In 1911, the Society of the St. Eugenia Community published 10 of Bilibin's photographs of the churches as a set of postcards sold to raise money to support its charitable work. 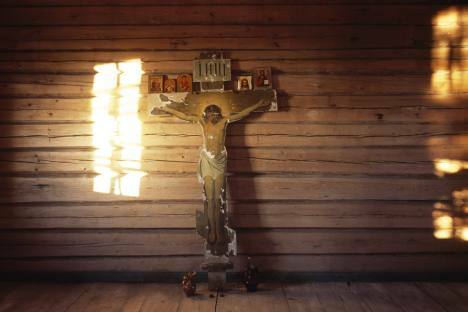 Seeing these beautiful postcards inspired British photographer Richard Davies to travel to the Russian North in 2002 to find out which churches had survived. Further trips have followed every year. Many churches have been lost: some have been left to rot; some have been destroyed by lightning; last year, one church was hit by a reversing tractor. There is however much to celebrate. The integrity between the landscape and the architecture of this wooden world is as striking today as it was to Bilibin. The basic simplicity of the log cabin construction and the extravagant fantasies superimposed on it are just as startling. Although the churches that remain are in varying states of decay and despite their neglect and the wrecking of their interiors, these extraordinary structures have a spiritual presence, which commands respect even in the absence of their gilded icons. Many churches have been saved by dedicated specialists and enthusiasts, whose untiring work goes on. Davies hopes that the photographs in this exhibition will help raise public awareness of the plight of these wonderful buildings and that more restoration projects will attract the funding they deserve. More information about the project of Davies is available on his website "Wooden Churches: Travelling in the Russian North 100 years after Bilibin."